Heavenly female vocals, traditional Celtic instruments, lush electronic soundscapes and symphonic rock, in a song cycle exploring the symbolism of water and its themes of transition, transformation, and The Hero's Journey. 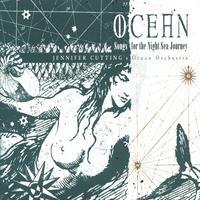 Composer/director Jennifer Cutting convenes a global orchestra of Celtic and British Isles music's brightest lights for her collage of sea-inspired pieces exploring the rich symbolism of water and its themes of transition, transformation, and "The Hero's Journey" in mythology and traditional music. Guest artists such as Maddy Prior and Peter Knight (Steeleye Span), the late Tony Cuffe (Ossian), Gabriel Yacoub, Dave Mattacks (Fairport Convention, XTC, Paul McCartney), Troy Donockley (Iona) and other leading lights from the British Isles and European scene are joined by U.S. luminaries Grace Griffith, John Jennings (Mary Chapin Carpenter band), Sue Richards, Zan McLeod, and others. Bulgarian diva Tatiana Sarbinska lends her riveting Balkan vocals to the album's electrifying finale. Celtic, symphonic, and electronic textures merge in Cutting's expansive sound canvases for Ocean. Heavenly women's vocals, harps, pipes, fiddle, accordion, and other traditional instruments fuse with keyboards, bass, drums, and electric guitar for a song cycle that moves from lush, ethereal soundscapes to energizing Irish tune sets and majestic artsong, evoking key stages in the human journey. Digging deep into archival sources for inspiration, Cutting researched obscure lyrics from the Irish oral tradition, Latin phrases from medieval alchemical texts, and glorious forgotten melodies from the manuscripts of turn-of-the-century folk music collectors. Seven years in the making, Ocean represents the culmination of Cutting's vision of blending the timeless beauty of traditional acoustic instruments with the shimmering possibilities of the latest music technology. Having achieved national prominence for her ancient/modern fusions as a bandleader, producer, songwriter, arranger, and instrumentalist on the critically acclaimed CD High Tea (New St. George, Folk Era Records FE1415), Ocean finds Cutting and her global orchestra poised for international success. May Ocean provide an uplifting soundtrack for traveling hopefully on life's changing seas. "What beautiful music... This album is truly an invitation to meet the mystery and be transformed by it." Wonderful music. Beautifully played and sung. I hope the Ocean Orchestra will be able to record more albums. I bought the cd for my wife, she is a message therapist, she loved it! Perfect music, soothing and very relaxing! I recommend it for anyone who is looking to relax and enjoy some beautiful music.